When running at the track (specifically: Laguna Seca), transmission temperatures north of 260 degrees were measured and, needless to say, that was too high. This was especially true given that once the temperature reached a certain level, it didn't go down to any meaningful degree in between track sessions. 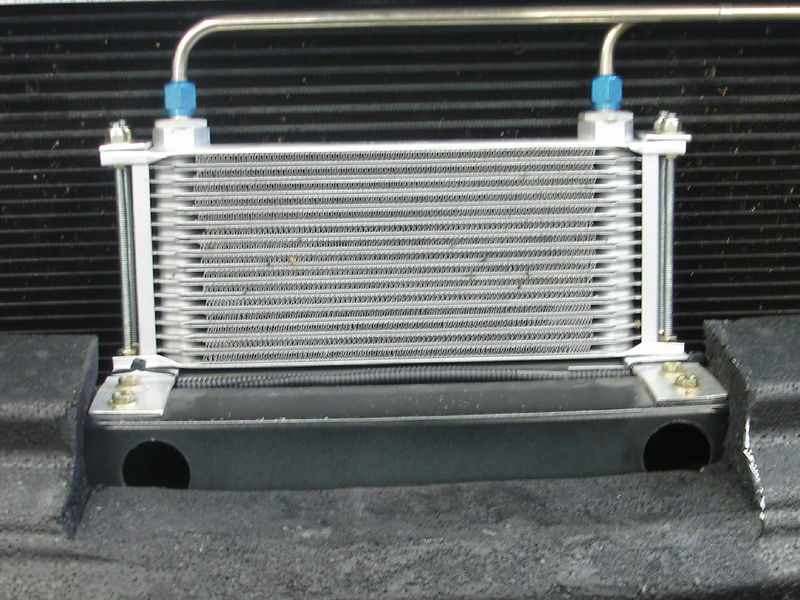 The LX platform does have a fairly large transmission oil cooler that dumps heat into the engine cooling (water) system via airflow through the radiator (the transmission cooler faces and effectively seals to the top half of the radiator). Additionally, the transmission lines have a thermostat that is set to bypass the cooler until a 165 degree temperature is reached. 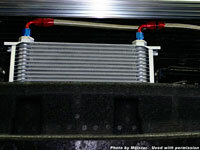 The transmission cooler benefited from the same research as was done with the oil cooler. Again the best choice was a turbolated stacked-plate cooler, and the unit with the best btu/hr cooling capacity for its size was from Earl's Plumbing. In this case, a 16-row, 37,000 btu/hr unit was chosen. 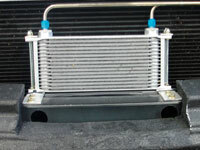 Mounting is described in the oil cooler page. My personal system uses hard stainless lines for looks and maximum durability, but this is not even remotely economical. Systems installed by others following these plans use -6 AN braided stainless lines, and the parts list below assumes this route is taken. 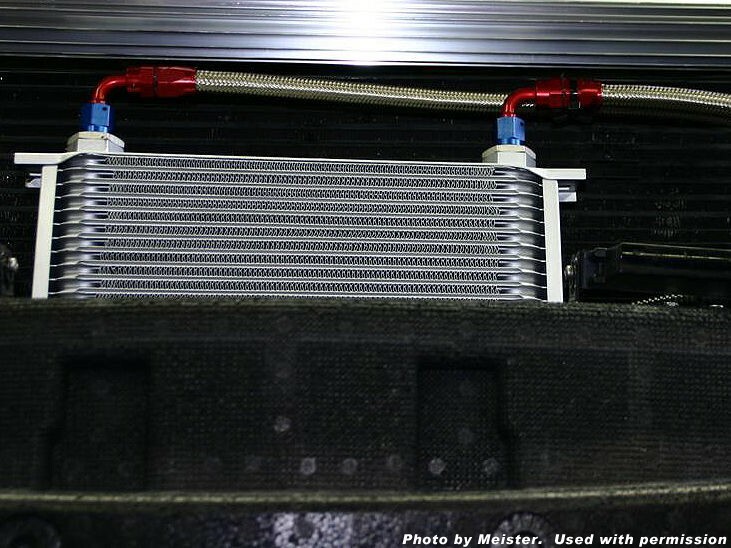 The original intent was to run both coolers in series, with the stacked-plate cooler in first position to bleed out as much heat as possible before the stock cooler comes into play and dumps heat into the engine water, thus taking some load off of that system. Circumstances on day of installation kept the stock cooler from being hooked back up, and while this was not optimal, it allowed the testing of just the stacked plate cooler. Temperatures were reduced with this one auxiliary cooler, but not dramatically so. However the removal of the stock cooler from the system resulted in reductions in water temperature of 20-40 degrees, depending on load. When eventually both coolers were hooked up as originally planned, transmission temperatures were reduced to the 190's. Better still, once load is removed the fluid temperature falls instantly. Net result: Transmission temperatures remain thoroughly controlled in even the most extreme circumstances. Mission accomplished.